With the release of the 2005 FOMC transcripts we learn that the Fed was aware of the housing boom but failed to alter monetary policy. Among other damning evidence, we find this gem in the December 2005 FOMC meeting. 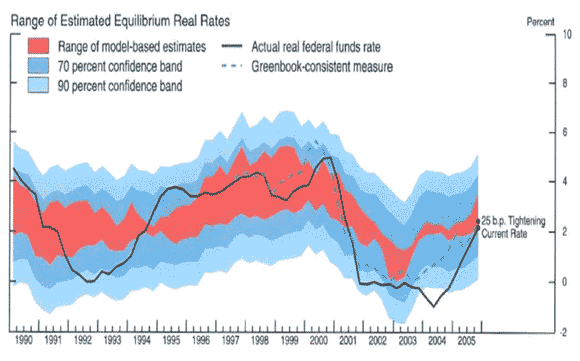 It shows the real federal funds rate compared to the Fed’s estimate of the equilrium or neutral real federal funds. There is a striking gap that emerges during the early-to-mid 2000s. This indicates the Fed was highly accommodative and aware of it. This monetary ease was an important contributor to to the credit and housing boom for reasons explained here and here. So much for Alan Greenspan’s challenge for someone to “prove him wrong” in his leadership of the Fed. As Yves Smith notes, what makes these and other revelations about this period particularly frustrating is that the Fed continues to shirk blame for the crisis.